We never like the look and damage a fallen tree can cause, which is why we will always answer the call for an emergency tree service. No matter what the timing or cause may be, we will try our best to be quick to respond to a tree-related emergency. We have seen the kinds of damage that a fallen tree can cause if they are just left to sit and continue crushing what is underneath, and we wouldn’t want it to sit there longer than it has to. We understand the urgency of these kinds of calls, and we will be quick to respond and give you a run-down of how it will all work out. 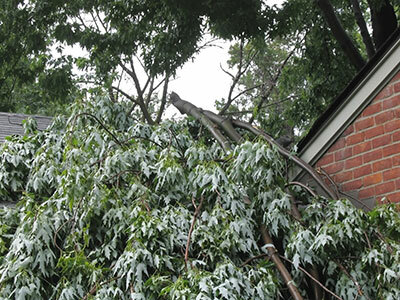 The most common kind of damage that is caused by trees is damage to a home or building from a storm. We always hate it when there is a major storm inbound, since it can spell disaster for even the trees that seem like they could never fall over. It’s never a good thing to have a multi-ton tree shoved into the roof of your house or the wall of a building, so its best that a professional team gets it out quickly and safely. We understand that these occurrences can happen at the most inconvenient of times, so it’s in our job description to get the tree out right away. 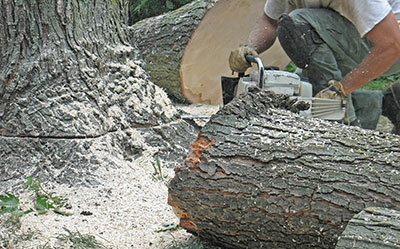 Another cause of emergency tree services are traffic related accidents that involve trees. We understand that it can be embarrassing to have to make the call and say that there is a part of a tree lodged in your car, but we will never judge. We completely understand that these kinds of things can and will happen, and we are here and ready to assist you. So, no matter how those branches managed to crush into your car, we will be out and happy to help get it off of your vehicle. Yet another, but somewhat rarer, instance of emergency tree service is the instance where you or someone else tried to cut a tree down by themselves and managed to get it stuck somewhere. Whether it is stuck on top of another tree or has become lodged in a building or home, we are ready to help with this situation as well. Or, if you have spotted a tree on your property that looks like it’s in need of some urgent care, please don’t hesitate to give us a call and tell us what the problem is. Really, by saying all of this, we are just giving some examples of reasons for an emergency tree service that you may need. However, we haven’t covered every example of an emergency, so if your emergency isn’t on this list, still give us a call and we will see what we can do for you. Whenever we come out to deal with the emergency call, we will always assess the best way to deal with any damages or problems that may be present. We will take the necessary steps to make sure the removal of any fallen trees is clean and well done as to not cause any further damage to whatever it is that the tree fell on. Once we get the tree out or cleaned up, we will be sure and properly remove any small remaining bits that are still lodged into the object. We won’t leave until the cleanup has been properly done. Another thing to mention is the cases where we cannot assist in everything that has caused damage or other factors. At this point, we will be sure and make the necessary calls or connect you with professionals that can repair whatever was broken in the incident. This is all part of the emergency service process. We will make sure that whatever has been damaged is not further damaged, as well as get you connected with people that can repair it. Once we have done our part in fully removing the tree and cleaning up the extra bits and pieces that may be spread around, we will make sure you are satisfied with what we have done. We take customer satisfaction very seriously and we will be sure to assist in whatever we can when you ask us to. So, if you are ever caught up with a tree-related accident, remember that you can give us a call to provide you with an emergency tree service to help and get the tree cleaned up as quickly as possible.